Sarah Winifred Searle’s upcoming middle-grade graphic novel Sincerely, Harriet, arriving from publisher Graphic Universe next May, fits comfortably next to some of the best-known titles for readers that age. It stars the titular Harriet, trapped in the awkward age that’s just on the cusp of adulthood, striving for independence but not quite equipped for it yet. When the book opens, Harriet is settling into her new home in Chicago with her parents, avoiding summer reading and her downstairs neighbor. As the story unfolds and the reader learns more about Harriet and the circumstances that led her family to move, it becomes clear that her relatable struggles aren’t just the average worries of a teenage girl in a new situation. Sincerely, Harriet is kind without sugarcoating challenges or offering up empty platitudes. It trusts the readers to understand that growing up can be hard, and that the things that make it even harder for you can be invisible to others. It’s the sort of book that can help young readers feel less alone as they face some of the same struggles, and doesn’t minimize the way kids feel. It’s also a graceful lesson in intersectionality, layering in multiple identities to create a character and a world that are rich and full of life so organically that it doesn’t feel like an afterschool special, just one girl’s authentic story. As Harriet learns about her new city, her new neighbor and herself, the book offers affirmations and affection that both Harriet and the reader may need. It’s the perfect addition to a collection that includes the likes of Judy Blume and Raina Telgemeier, and Paste was thrilled to chat with Searle to learn more about it. Paste: Though it’s far from the only work you’ve done in the last couple of years, I think a lot of your fans may be more familiar with the stories you did for Fresh Romance and The Nib; much of your previous work has been for adults. What in particular appealed to you about creating a middle grade book like Sincerely, Harriet? Sarah Winifred Searle: I read an interview with Maurice Sendak a while back where someone asked why he made work for kids. His response (poorly paraphrased by yours truly) was something like, “I don’t. I make books and then they tell me they’re for children.” That’s pretty much what’s happened with Sincerely, Harriet and most of my other work. I find seeds of inspiration in history and media and people’s experiences, and a story begins to take shape. My agent and editors help me figure out where the characters and themes sit, market-wise, and we gently mold these ideas into something more polished. I never set out to become a middle-grade author, but since realizing that’s where Harriet belongs, I’ve grown such an appreciation for this market and its special challenges and rewards. Paste: Harriet is a relatable and accessible protagonist, a young girl feeling isolated by her arrival to a new home in a new city. One of the things that’s really appealing about the book is the specificity you use to describe her life, with details that add texture and depth. Did Harriet form slowly in your head, or did she arrive fully formed with all those details in place? Searle: It honestly feels like she sprouted fully formed from my head, Athena-style. She’s inspired by visceral memories of what growing up in the ‘90s was like, and how the stories I loved shaped my view of the world. For example, she can’t get enough of the movie Beetlejuice, and she wants her life to reflect that. All of this is informed by her environment and the people who surround her, which gave me a great opportunity to play with the house as a character in itself. Paste: Harriet’s new home, the kind of older multi-unit building that’s especially common in big cities, has a lot of details of its own. You’ve worked on period pieces as well—is there something about older buildings that attracts your creative attention? Searle: Definitely! I’ve spent my life moving through a series of weird old buildings with apartments carved creatively out of previously single-family homes, locked doors that lead to nowhere, and even a couple converted hotels with mysterious walled-over windows and decommissioned century-old bells. I’ve always been into history, and I’ve always wished I could know the full lives of the places I’ve lived. To indulge that curiosity, I drew two different floor plans for Sincerely, Harriet while scripting it: one version from when Pearl’s children were young and they utilized the entire townhouse, and then another after they turned the second floor into an apartment on a slim budget. I like to think the quirks left behind through its transformation sparked Harriet’s imagination just as much as it did mine while growing up. Paste: Old houses like the one that Harriet’s family move into are often used as a setting for horror stories, but in this book the house has history and memories but doesn’t feel frightening or unwelcoming. How did you keep the setting from becoming spooky instead of emotional? Searle: Oh, I considered making it spookier, for sure, and it shows in earlier drafts. But that just wasn’t where the heart of the story rested. Once I created the characters and house and could clearly see the arcs that needed to happen, the book pretty much wrote itself, and I wasn’t going to deny Harriet any of that warmth. Paste: A lot of the details that come out as Harriet’s story unfold shift from subtext to text, but some things remained implied. How do you chose which story elements to state outright and which elements to hint at? Searle: It all pretty much comes down to what felt organic to state outright. For example, Harriet never proclaims her gayness, but she also doesn’t have to; her crush is what it is, a precious thing she holds close to her chest, and from some background details I drop, it’s safe to assume her folks already accept that about her. It’s a thing of pure joy for me, to write about this queer little family who can feel warm and safe in who they are without it being a big deal. Paste: The book ends with an author’s note about Harriet and the illness that impacts her everyday life. Was this addition always part of the plan for the book? What made you want to add it? Searle: I added the author’s note later on because I realized I couldn’t afford to miss an opportunity to speak directly with this audience about chronic and invisible illnesses. More outreach to help kids understand and empathize with the experiences of people who have them is always needed. Plus this theme’s position as an intersectional issue gave me space to call out racial segregation by name, which will hopefully help some younger readers connect the dots on how that influences how Pearl tells her story. I hope it’ll inspire more curious kids to do some research of their own to learn about civil rights, the success of the polio vaccine and other threads I wove in there that might seem historical, but are relevant to very serious issues that we still face today. Paste: A lot of stories use houses as metaphors for bodies, families or both. Sincerely, Harriet centers all three. How did you envision Harriet’s family, her environment and her body impacting her? Do you think the effects of that conflict, or compound? Searle: They all build on each other to inform her growth as a person, for sure. The conflict in this story is in the fact that this 13-year-old kid is at a pivotal point where she needs to figure out how to accept and manage all these moving pieces within her life. There are no villains, not even in her disability — I was very intentional about that. Paste: In your author’s note, you gave readers a hint of how another character was doing since he’d grown up and was an adult by the time Harriet learned about him. What is your vision of adult Harriet? 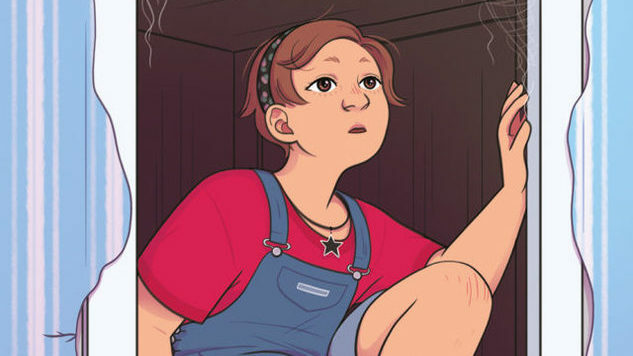 Or even young-adult Harriet? Searle: None of this is official, but for now, I like to think Harriet joins her high school’s AV club and goes on to major in new media at a community college. It takes her a good while after graduation to figure out the kinds of stories she wants to tell and how she wants to tell them, a journey informed by some interesting day jobs and unusual friendships. Someday she’ll make being a late bloomer seem like the coolest thing you could be.